Five years after her groundbreaking exhibit of Salton Sea art, Valley of the Ancient Lake, Deborah Martin again brings together a mix of artists interpreting the Sea. 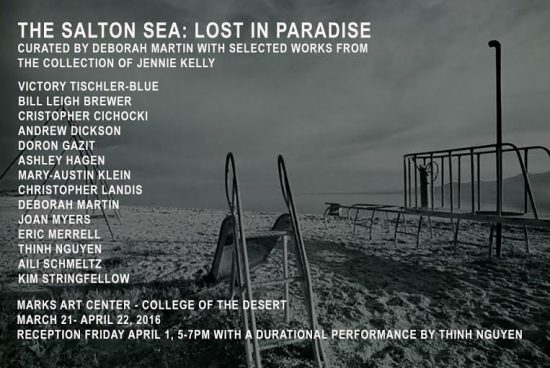 The new exhibit, The Salton Sea: Lost in Paradise, opens March 21st, 2016, at the Marks Art Center at the College of the Desert in Palm Desert. The original exhibit was held in 2011 at the North Shore Beach and Yacht Club with the assistance of the late Salton Sea History Museum founder, Jennie Kelly. Deborah featured artists focused on decay alongside those who stubbornly see the beauty of the Sea. This time, as well, the beauty camp will be well-represented by Andrew Dickson, Mary-Austin Klein and Eric Merrell, who worked on Salton Sea nocturnes for this exhibit. The despair camp will be covered by Cristopher Cichocki, environmental artist Doron Gazit , LA artist Thinh Nguyen (who is doing a performance with tilapia bones) and others. The Marks Center exhibit will include early Sea memorabilia from the collection of Jennie Kelly and the Salton Sea History Museum. Deborah Martin is an artist, photographer and curator known for her exploration of the twin saline landscapes of Salton Sea and Cape Cod. She lives in Sky Valley. The exhibit runs from March 21st to April 22, 2016, with an opening reception Friday, April 1, 5-7 pm, featuring a performance by Nguyen. The COD faculty and staff reception on March 31st, 5-7 pm, is also open to the public. Like many, Yost was nearly discouraged by teachers: “In school, I could draw the most beautiful line as one side of a vase or an apple, but when I tried to draw the other side it came out sadly crooked,” she wrote. “The teacher pointed out this fact to me by saying: ‘You’ll never be an artist. '” But then Yost found an ad for a class in the desert: An Art Class for People Who Cannot Draw. You can see what happened next at Studio 235 on Saturday, 1-5 pm. For information call (951) 378-3443. 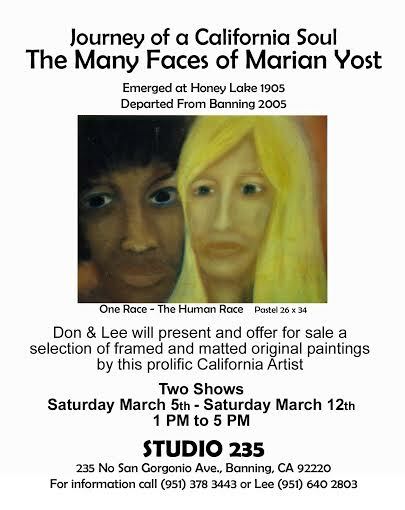 Studio 235 gallery can be found at 235 N. San Gorgonio Ave. in Banning. Readers of this website have asked what will become of Edan Hughes’ extensive archives and art collection. 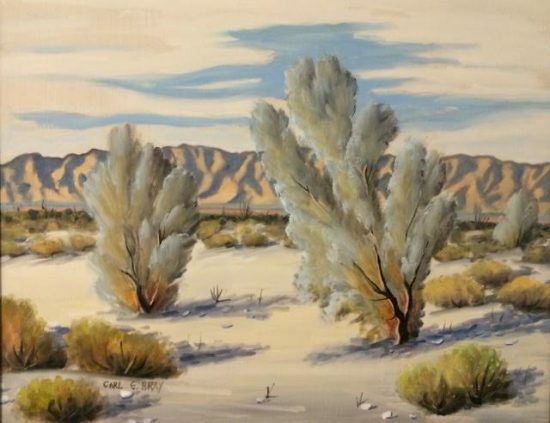 Hughes, who passed away in April, 2015, was the reigning expert on California art. 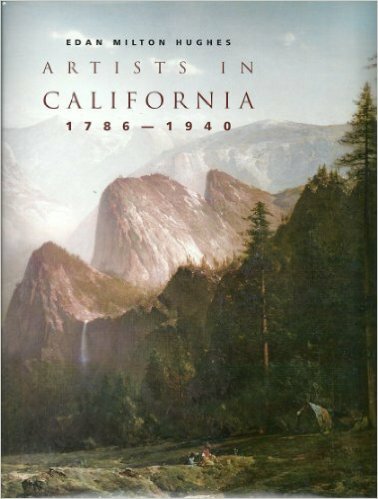 His 3-volume reference, Artists in California: 1786-1940, is the essential guide for museums and collectors. “Edan’s wish was that his biographies and the research materials that accompanied them be given to the Crocker Museum in Sacramento, where they have a gallery with his name that includes many of the paintings he donated to them. 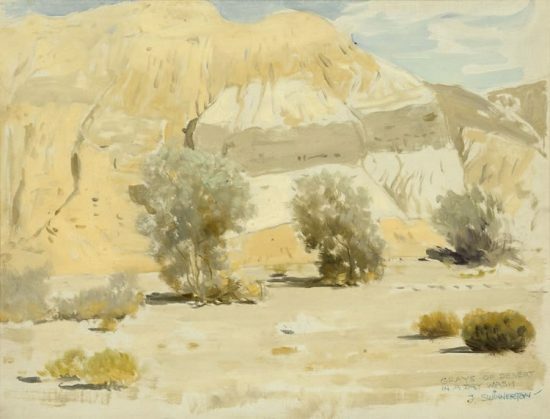 Wayne said Hughes collected many desert paintings. They are some of Wayne’s favorites and many are for sale on the site. He added that there may yet be a fourth edition of Edan’s guide, as the author was still finding new sources for biographies in the last month of his life. Fred Carlson lived in Indio in the 1970s, working for the County Agricultural Commissioner. 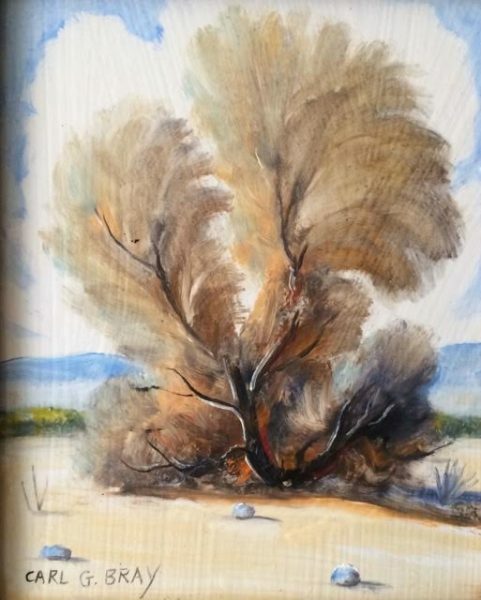 “Those were the days of Desert Magazine and the wonderful Palm Desert Art Gallery,” he recalls. Point Happy was still all sand dunes; Fred found an Indian metate not far from Carl Bray’s gallery. His sister and Mom frequently visited Carl at his gallery and Fred inherited five primo Brays, with frames made by Carl himself. He’d consider an offer for the group. I have a feeling there’ll be a discount for fans of Desert Magazine and old railroads. thank you dear ann, for the humanity and realness for/of how and why, such soul stirring art(s)!